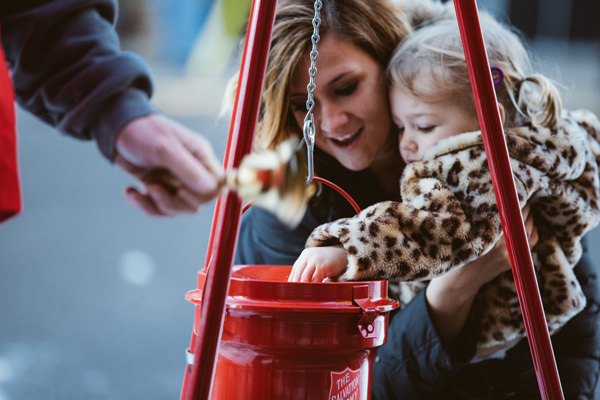 The Salvation Army USA Blog - The Salvation Army’s 126th Red Kettle Campaign brings in $147 million! The Salvation Army’s 126th Red Kettle Campaign brings in $147 million! At The Salvation Army every day is about Christmas, because the programs and services we offer all around the country are provided in part by the generous Christmas-time donations of millions of people! The 2016 Red Kettle Campaign brought in a whopping $147.3 million, thanks to our corporate partners, thousands of bell-ringers, and millions of good people with their hearts and hands open to those in need. That money enables The Salvation Army to provide more than 25 million people throughout the year with more than 56 million meals and 10 million nights of shelter, as well as youth programs and summer camps, adult rehabilitation services and more. To make all this happen, The Salvation Army had an all-star team of partners that are committed to Doing the Most Good. Jerry Jones, owner and general manager of the Dallas Cowboys, Charlotte Jones Anderson, executive vice president and chief brand officer for the Dallas Cowboys, and Commissioner David Jeffrey, national commander for The Salvation Army USA, participated in a series of TV interviews from AT&T Stadium, home field for the Dallas Cowboys, the day before the big Thanksgiving Day game between the Dallas Cowboys and the Washington Redskins. (The Cowboys won, by the way: 31-26.) Eric Church performed at the halftime show, officially kicking of the 2016 Red Kettle season, making it the 20th year the Dallas Cowboys have partnered with The Salvation Army, raising more than $2.2 billion since the partnership began. Corporate partners also contributed greatly to the success of the 2016 Red Kettle Campaign, with more than 25,000 Salvation Army volunteers throughout the country ringing bells and soliciting donations outside several store locations. Red Kettles outside of 5,093 Walmart and Sam’s Club locations across the U.S. collected $44.25 million, which contributed about 30 percent of the $147.3 million total. More than 2,400 Kroger family stores hosted red kettles, raising a total of $16.9 million, or 11 percent of the $147.3 million total. Red Kettles at roughly 700 JCPenney stores collected a total of nearly $2.7 million for the campaign, 500 Big Lots locations raised $888,900 and 79 Bass Pro Shop locations raised nearly $400,000. The Salvation Army also continued its #RedKettleReason initiative, a movement fueled by America’s motivations for donating to the red kettles. New this season, The Salvation Army called on Americans to start their own #RedKettleReason fundraisers, and offered the opportunity to designate their contributions to support cause areas that fight hunger, provide shelter or ensure Christmas assistance for those in need. Actor, producer and musician Nick Cannon led the charge in his second year as #RedKettleReason Ambassador, and he asked his fans to help him make Christmas bright for children and families in need. He was joined by trick-shot artist Brodie Smith, the first family of viral video The Holderness Family, and beauty and lifestyle vlogger Dulce Candy. We were honored to partner with such big personalities to spread the word about giving back in the community. From its humble beginnings as a program started by a Salvation Army captain in San Francisco in 1891, the Red Kettle Campaign has grown into one of the most recognizable and important charitable campaigns in the United States. It provides toys for kids, coats for the homeless, food for the hungry and countless social service programs year-round. That’s why the bells never stop ringing, because the coins and dollars you drop in a Salvation Army Red Kettle will feed, clothe, house, uplift, relieve and support those in need in your community all year long. Learn more about the programs provided by generous donors, through The Salvation Army, at www.SalvationArmyUSA.org.